Urban automation, or the implementation of artificial intelligence, robotics and other technologies in order to support the urban environment, is on the rise. In the age of Alexa and Siri, we are no strangers to urban automation, the problems it solves or the problems it creates. As a major university within a major urban environment, Tech is an epicenter for discussing and implementing such technologies. On Jan. 24, a research forum convened in the School of Building Construction to discuss the topic of “Ethics and Values in Urban Automation” and continue the conversation about our technologically subsidized futures. The panel focused on bringing together faculty and researchers within the College of Design to have an interdisciplinary discussion about the ethical questions within urban automation. 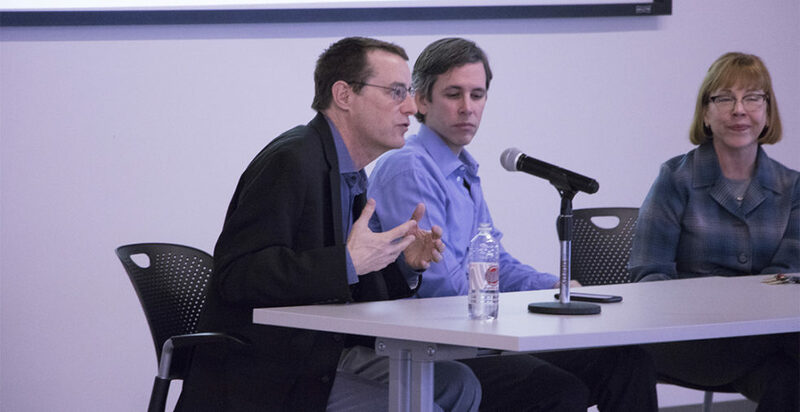 Jason Bornstein, the associate director at the Center for Ethics and Technology, and professor within the School of Public Policy, kicked off the forum by noting the difficulty of changing the currently human-controlled environment to an autonomous one. Self-driving cars, one of the most notorious examples, shed light on the disconnect between the levels of human and technological communication. A world with both human and self-driven cars leaves room for human impairment, a factor that self-driven cars may not be prepared for. Additionally, human-driven cities are ruled by crosswalks, intersections, traffic lights and varied transportation methods like motorbikers and cyclists. The switch to an autonomously driven world may not require previous human constraints. This would transform the traditional design of urban neighborhoods and require a drastic shift in design values and ethics. The next panelist Nancey Green Leigh, associate dean for research and professor within the School of City and Regional Planning, carried Bornstein’s point into a new ethical argument: data-driven urbanism. Leigh noted that an increase in urban automation has seen a rise in public sector entities collecting data about human-urban interactions, and raised the question of human rights to data privacy and surveillance. Utility, home appliance, phone and transportation companies are just a few examples of industries benefiting from data collection within the urban environment. The data collected reveals information about one’s location, personal space, transactions and more. Leigh questions whether citizens of these urban-automated environments are seeing tangible returns from sharing their data, or if urban environments are giving rise to a larger ethical dilemma in the form of breaches of privacy. Dennis Shelden, the Director of the Digital Building Lab and Associate Professor in the School of Architecture, built off of Leigh’s argument using his perspective from his professional experience in applying digital technology to building design. Shelden speculates the future of architecture will be rooted in a “digital physical hybrid” model, where sensors and devices will gather information to streamline building energy performance, understand customer perceptions and interactions in retail, and gauge consumer interests without the need for physical transactions. Similar to Leigh, Shelden wants to know what a citizen’s rights are in interactive environments. He states that while certain interactions with urban automation are voluntary, interactions with buildings are inescapable. Shelden drove his point home with a summarized quote from Shoshana Zuboff’s latest work, “The Age of Surveillance Capitalism”: “Surveillance capitalism unilaterally claims human experiences as free raw material into data. While some goes into improvement, the rest are a behavioral proprietary surplus.” In short, our privacy in an urban automated world lacks protective measures for the user. To round out the research forum, Carolyn Phillips, the interim director of AMAC Accessibility, shifted the conversation to focus on the ethics behind using urban automation for the benefit of disabled individuals. Phillips also pointed out the issues surrounding data privacy, stating that people with disabilities often require technological assistance to get by and have no choice but to volunteer their personal data to companies. She stressed that going forward, urban environments should adopt a universal design principle that requires inclusion from ideation to implementation within the design process and addresses privacy issues for everyone involved. After opening the floor to questions, the panel concluded by summarizing the importance of continuing to ask ethical questions as well as allowing these questions to evolve alongside the advancement of urban environments.